An accident in Linden, New Jersey brought traffic to an absolute standstill on Tuesday. 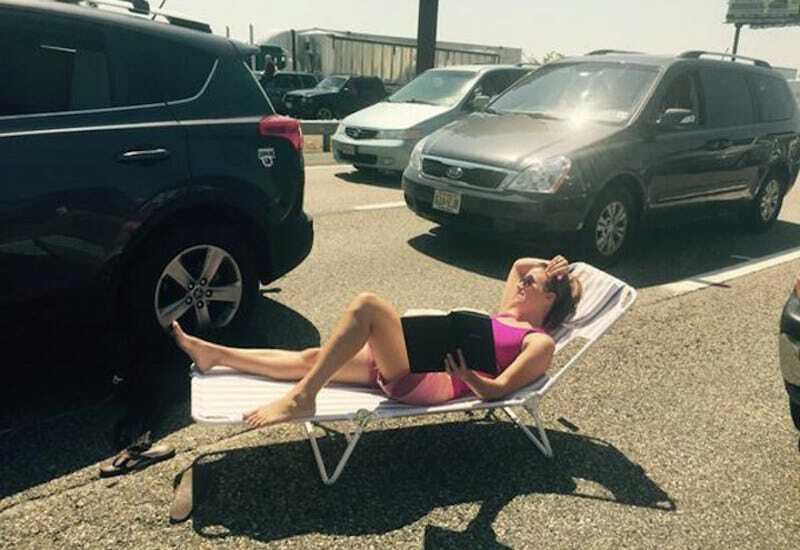 While some people must have been sitting in their cars grumbling, some other motorists chose to make the best of the hours they were stuck in traffic by engaging in summer activities they might have missed otherwise. The New York Post reports that the nightmare began at 10:30 am when a dump truck overturned after hitting “the underside of an overpass,” killing the driver and setting fire to the overpass. The New Jersey turnpike had to be closed for hours in order for officials to make sure that the overpass wouldn’t collapse from the heat the fire produced. The area’s electric company also needed to restore power to as many as 75 businesses due to the heavy damage taken by underground electrical facilities. For some, this meant an entire day wasted. For others, it was just another opportunity to “say yes” to a strange and exciting situation. Video captured at the scene during the day showed traffic at a total standstill — with drivers out of their cars, standing in groups or alone on the shoulder as they looked mournfully at the line of vehicles. Some people were seen playing football as they tried to pass the time, while others laid out to sunbathe. One driver stuck near exit 12 on the northbound side photographed a man skateboarding between cars. Construction on the turnpike was halted until Wednesday morning so that motorists could continue clearing the traffic. Officials hope that driving conditions will go back to normal quickly.